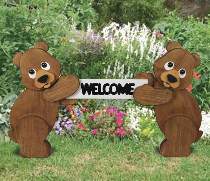 Two cute, chubby bear cubs greet your guests with this 21"H welcome sign. Plans drawn FULL SIZE. Order two pair of brown eyes, one welcome decal and two fiberglass rods separately below.